The 1st Earl of Aberdeen was a brilliant lawyer who found a patron in the Duke of York (later James II), who administered Scottish affairs on behalf of his brother, Charles II. In 1682, he was appointed Lord High Chancellor of Scotland, and in the same year was awarded the earldom of Aberdeen. He married a rich heiress, Anne Lockhart, and in 1684 moved to his estates in Aberdeenshire. Between then and his death aged 83 in 1720, he added large tracts of land to the already substantial estate, which had originally commenced with the purchase of land around Methlick by his forebear, James Gordon, in 1467. The 2nd Earl flirted with Jacobitism, but, conveniently for the family, chose not to support the failed uprising of 1715, and died shortly before Bonnie Prince Charlie raised his standard in 1745. He is perhaps best known for engaging the leading architect of the day, William Adam, to build Haddo House. The new mansion, completed in 1735, was built to replace the old House of Kellie, which had been razed to the ground in the Covenanting wars of the 1640s. He extended the family estates considerably, and married three times. The third marriage was to a daughter of one of the most powerful noblemen of his time, the 2nd Duke of Gordon. The Duke insisted that a suitable property be purchased for the descendants of this marriage, and so the castle and estate of Fyvie were bought by the Earl to satisfy his wishes. Gordons continued to live there until its sale to the Forbes-Leith family in 1889. The 4th Earl attained the greatest prominence of any member of the family, becoming Foreign Secretary, and then Prime Minister during the reign of Queen Victoria. The beautiful appearance of the Haddo policies is largely due to his improvements, including the planting of no less than 11 million trees, many by his own hand. He also added the stable block and the courtyard adjoining the South Wing of the House. In many ways, despite his achievements, the ‘Premier’ Earl suffered a tragic life. His father was killed in 1791 after being thrown from his horse at the nearby Gight Castle when he was just 28 years old, and his mother died soon after. His first wife died young, and one by one each of his beloved daughters from that marriage succumbed to tuberculosis. He also suffered the death of his brother, Alexander Gordon, at the Battle of Waterloo, and was widely criticised for leading the country into the disastrous Crimean War. In spite of all this, the 4th Earl was held in high esteem by prominent figures of the day, not least on account of his efforts to stabilise relations with the United Kingdom’s old enemy, France. Queen Victoria, who visited Haddo and purchased the Balmoral Estate on the 4th Earl’s recommendation, is reputed to have favoured him above all the premiers of the middle part of her reign. William Gladstone, Prime Minister for two terms in the latter half of the 18th century, said of Aberdeen: “he is the man in public life of all others whom I have loved... I say emphatically, loved ”. His life inspired the historical novella Umbrella,by Ferdinand Mount. The 1st Marquess, known fondly as ‘Johnny’ within the family, unexpectedly inherited the family estates following the deaths of his two elder brothers. Together with his wife, Ishbel, he was active in Liberal politics, and spent much of the family’s wealth on charitable causes. He held a number of important public appointments during his life, most notably as Viceroy of Ireland (1886) and Governor General of Canada (1893-1898). It was largely for this public service that he was elevated to the rank of 1st Marquess of Aberdeen and Temair in 1916. His and Ishbel’s influence on the House is the most enduring, seen today in the Victorian interiors of the house. He also added the chapel, the hall, and an enlarged entrance hall to the house. Alastrean House near Tarland, now a care-home, was built by him and his wife as a Deeside retreat. 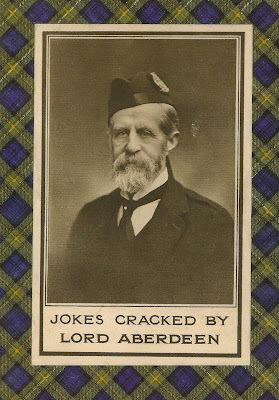 Johnny has latterly gained unexpected cult status thanks to his book Jokes Cracked by Lord Aberdeen, the cover of which has appeared on some gift cards. It is unfortunately no longer in print. The 4th Marquess inherited the Estate from his uncle, the 2nd Marquess, as the Second World War neared its end. He did much work to modernise the estate, but is best known for founding, together with his wife June, the Haddo House Choral and Operatic Society. This staged annual operas and other musical events in the hall, and attracted many well-known musicians and composers, such as Ralph Vaughan-Williams, Benjamin Britten and Janet Baker. Before his death in 1974, David had started negotiations with the National Trust for Scotland and Grampian Regional Council, culminating in the house and surrounding gardens being transferred into the ownership of the Trust, while part of the policies became the Haddo Country Park.